CD/CD-R/CD-RW compatible, HDCD decoder with automatic detection, Burr-Brown Sigma-Delta 24-bit digital to analogue converter, Nichicon â€œMuseâ€ capacitors, coaxial and optical digital outputs, low output impedance, separate power regulators for analog and digital sections, VFL display with selectable track, time and repeat, repeat mode for single track or entire CD, program play up to 20 tracks, random play, external IR input, 12V trigger input, NAD CD-6 full function remote control. I went to different Hi-Fi stores searching for the right Amplifier and CD player for me. One of these store salesman introduce me the integrated amplifier NAD 356BEE and the CD player C542. It was amazing experience. I told to myself these two pair made my search over for my kind of music. The sound stage is airy and relaxing to hear irregardless of whatever sounds you play on the C542. It is a laid back musical experience close to vinyl pure analog listening. The DAC on the CD Player plays an important part in reproducing the details of sound as intended for the listener to hear right from the recording companies. 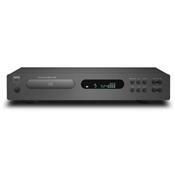 An outstanding CD Player at it’s price range paired with NAD amplifier- this time NAD356BEE. Excellent built and Class A component inside to deliver the clear, detaiedl and relaxing sounds that you can enjoy for hours of listening. Never tiring moment as you listen to your favourite CD. Value for money at this price range. My humble verdict is 5 out of 5 stars. Some CD-R / CD-RW are incompatible in playing with this C542. But I’m not bothered as I always let the player to play originally recorded songs like XRCD [16 bits to extended 20 bits CD]. Much more airy and engaging rather than compressed files. My concept in buying a HI-FI CD player is to experience the true sound that this recording company wants us audiophile to enjoy. NAD you did it again. These pair made me satisfied. C542 is no longer at production but I still prefer this player for more years to come. I paid USD420 for this piece of near-junk in Mar. 2007 in Hong Kong. Initially I bought a lower grade model (1 step down) and to my amazement, when I put put in the first CD, it wouldn't even work, couldn't read, i.e. wouldn't even spin, just dead. So I brought it back to the shop immediately, and got a new one. Tried it there, this time, when the salesman took the CD out, there was several droplets of water on it!!! I called up their service center and filed a complaint, and they recommended this "better version", the C542. Being 24 bit, the sound is better, acceptable. After 1 year and 2 months, when the warranty JUST expired, this C542 started to skip tracks, always around the 4th/5th song, vertually with every CD (they're originals, and scratch free). I remember an old trick which I used with my previous CD player. So I opened the CD player and wiped the steel rod which the CD head travelled on with engine oil (any hardware store has it), as I figured the problem was caused by a slight tug at the same spot. It worked. No more skipping. For the last 3 years, every 7-8 months, the same problem came up, and I had to do the same exercise. I wouldn't advice anyone buying NAD junks unless you're prepared to face challenges that you never had with CD players in your life. Sound is exceptional for the price, very good DAC chip and other critical internals. The charcoal color is much more appealing (and matches other components better) than the old NAD grey. Build is a little on the cheapo side. Needed to replace a Rotel RCD 961, which I sold before having another CDP (bad move. Man, I loved that darn Rotel). Started off with a Cambridge Audio C640 v2. The build quality most resembled my Rotel--heavy, solid exterior and full metal faceplate--and it had good reviews. Had to return it a week later due to some tray issues, but the store didn't have another. Found the 542c on clearance and pretty happy the Cambridge device crapped-out on me. First, the build quality is NOTHING like Rotel or CA--when you pick it up, it's pounds lighter due to a very thin sheet metal case, and almost feels fragile. But the devil is in the details. Sonically, it blew my old Rotel out of the water, and has a much more laid-back sound than the Cambridge, with a more natural, clear sounding mid- and high end. Compared to the Cambridge, the 542 is definitely a little weaker on the bottom, but the bass it produces is well defined. The front panel controls are straight-forward and well laid out--nuthin' fancy. It takes a firm push on the buttons to activate a function, but experience has shown that those will probably soften up a little with time. And I was surprised (pleasantly) when I took it out of the box and saw it was charcoal black. I was expecting that industrial, pukey light grey that coats most of the older NAD products. 2009 will see the entry of a new line-up for NAD, but there are still plenty of new 542's out there, and bargains can be had. My sales guy convinced me the Burr-Brown DAC in the 542 beats the pants off the newer C515BEE, which has a Sigma-Delta chip. The reviews seem to support that. Nice sound. And that's all. That is when you can get it to work. Purchased this C542 unit to replace a NAD C540 because the transport mechanism on the 540 crapped the bed. It wouldn't recognize any disks, and had to fiddle and fuss with it (to the point of hitting the unit on the side to get it to "see" the disk) just to play a disk. I opened up the unit, (warranty expired) to fine that the spindle was getting stuck on the up swing. The hit on the side released it. So, I went to get the C542 as a replacement and upgrade. After the salesman's assurance that the transport mechanism on the C542 is much better, I bought it, and was very pleased with the sound for the money. It's a definite improvement over the C540 which I liked also. After 3 to 4 months, the better transport mechanism of the C542 started acting up worse than the C540. It's been progressively worse since that time. I wasn't about to go through the many months of repair back and forth that I went through with the C540. It doesn't seem worth it to purchase a unit just to have it sit at some repair facility when there are so many excellent units on the market that actually work. And after reading the reviews here, it seems that more than a couple folks have had the same experience. So, I'll save up my cash and get a Rotel, several of which I've heard and sound marvelous. A friend of mine has a Rotel unit that sounds exceptional, and at no extra cost, actually plays the CD every time, without having to kick it in the slats. I'm not giving NAD a third chance, they can keep there products. Clear and detail soundstage; good managed full spectrum frequency response and works with my NAD T760 remote control. Now I can shelve the CD player's remote control. It plays HDCD. Value for money. Probably the best CD player at this price. Simple design remote control. Does not really play CD-R / CD-R/W as it claims. I have only successfully play CDs that I burn a few times. Most of the times it will fail. The timing of the sound reproduction can be a bit "rush" when comparing to the sound coming from a $2000 CD player. I had a bit of luck purchased this "new" unit from eBay. The soundstage is quite clear and has a lot of details. The frequency responses is quite smooth and natural even at high and low frequencies, although the interconnects also play a part in it. I enjoy it very much. This is the first time I can hear such depth and positioning of sound from a CD player. Clear and beautiful soundstage, smooth and natural sound and with good base response. The interconnect does make some differences. Currently I am using Audioquest Diamondback. It is value for money. Perhaps the best CD player for this price. I am also able to use my NAD T760 remote control to manage the CD player without any physical connection. Please do not expect it to sound like a $2000 valve CD player. The sound is a bit "rush" when I had an opportunity to compare to one. It cannot play CD-R/ CD-RW very well as it claim it can. So far I have only been able to play a few times successfully. Most of the times it fails. Remote is too simple. I have a bit of luck purchased this from eBay. The overall soundstage is good and very detail. There are clear and smooth response across full range of frequencies. I am not a particular fan of HDCD and have not found it to be extremely entertaining as some have written. Perhaps I have not come across a very good HDCD recording yet. There has been no noticable difference for those I have tested. Got this to replace a Phillips DVD-825, which was the highest rated unit in its (budget) class for CD audio playback when it was new. Before deciding on the C542 I did a lot of research on this site and elsewhere. However, I was unable to audition anything since there are no audio stores in my area. So I cannot say how it audibly compares to its competitors. But I can give you my impression of how it sounds in my system. I let it break in for 8 hours by playing cds through an old tapedeck I had lying around. Then I put in the system. I was underwhelmed to the point of dissappointment. It was flat, dull, and bloated. Way, way laid back to the point of being stuffy....I was thankful I didn't get the Marantz, and wishing I had got the 521BEE. I had been expecting a punchy, dynamic presentation, similar to the Philips. But the wife liked it right away, saying it sounded much better. So that was something. Time to figure things out. I have a relatively small room and small speakers, so I have the speakers fairly close to the back wall: mostly for space but also for boundry reinforcement. Considerable time had been spent finding the exact right spot (within my space constraints) for the speakers to acheive a punchy bass with the old player. They were simply way too far back. A week spent listening and evaluating and moving speakers every day paid off. Now it sounds really good and I am quite happy with it. The bass and mids are really nice. Vocals are especially sweet, "Down to the River" on the O Brother Soundrack sounds absolutely marvelous. On jazz the electric bass and kick drum come through nicely. It is true the more I play it the better I like it. Don't know if that is due to break-in or the aesthetic of familiarity. Of course I was tweaking speaker placement for the whole first week, which helped the continuous improvement. One other caveat--when I play the zero data track of my test CD there is a high pitched digital whine coming thru that is considerably louder than the background hiss. This, of course, is with the volume pegged. But it is still discernable ear to the tweeter at half volume. My Philips CDR-950 does not have this, nor does the 825, and I don't remeber the Adcom having this either. Makes me wonder about the filtering..... At normal volumes it is inaudible, I did not know it was there until I ran the test CD, which I did not do for weeks. I just now ran a few tracks through it and it sounds great. Smooth integrated sound. Everything is there: highs, mids, lows. I am happy with my purchase and recommend this player. But still I can't help but wonder if the 521BEE would have sounded just as good in my system. Natural sound; nice imaging and soundstage. This player sounds nice for the price while it works. It has decent imaging and soundstage. The sound is natural and not edgy. It also works well as a transport when I plugged it into my EVS DAC. I had it for 6 months when the CD tracking started going bad, then the output stage didn't produce any sound. I took it to my local dealer and they sent it for service. After a month or so I called to see if it had been repaired and it hadn't. This went on for 3 months until they finally called around and found that the service company NAD uses hadn't received the parts to fix it. I finally got it back 3 MONTHS LATER. Then to add insult to injury, the CD player didn't work when I got it -- it produced no sound on the RCA outputs. I have now been waiting to hear back if NAD will replace the unit or repair it yet again. In my 20 years of buying hi-fi equipment, I have never had customer service this bad. I will NEVER buy another NAD product again. The worst I've experienced in an audio company. California Audio Labs Icon; Sony DVD. Got this to replace a Phillips DVD-825, which was the highest rated unit in its class for CD audio playback when it was new. I was underwhelmed to the point of disappointment. It was flat, dull, and bloated. Way, way laid back to the point of being stuffy....I was thankful I didn't get the Marantz, and wishing I had got the 521BEE. I had been expecting a punchy, dynamic presentation, similar to the Philips. Time to figure things out. I have a relatively small room and small speakers, so I have the speakers fairly close to the back wall: mostly for space but also for boundary reinforcement. Considerable time had been spent finding the exact right spot (within my space constraints) for the speakers to achieve a punchy bass with the old player. They were simply way too far back. A week spent listening and evaluating and moving speakers every day paid off. Now it sounds really good and I am quite happy with it. For the first time I have a system that can play full-scale orchestra music without embarrassing itself. Vocals are especially sweet, "Down to the River" on the O Brother Soundtrack sounds absolutely marvelous. I just now ran a few tracks through it and it sounds great. Smooth integrated sound. Everything is there: highs, mids, lows. I am happy with my purchase. But still I can't help but wonder if the 521BEE would have sounded just as good in my mid-fi system.